Indexed in: Scopus, EBSCO., Ulrich's Periodicals Directory. I find this work very moving. It is a critique of the present approach to special education informed by a poststructuralist framework, utilising extracts from the diary of the principal of a special school. Cath Laws reflects not only on existing discourses in relation to positions of 'bad, mad, and sad' within special education but also, critically, on her own practice, and therefore makes an important intervention into the practices of special education. This work does not use Foucault in the traditional way, but more as a point of departure toward understanding the positioning of the subjects within the special school. It is this different approach which makes the work so moving and provides insights about subjectivity quite different from those in standard Foucauldian work. The quality of this work lies in its thoughtful engagement with the discourses and practices of special education, and its use of a narrative approach, which in itself challenges the 'education as truth' doctrine found in the fields Laws critiques. It is a highly significant presentation of crucial issues for practice, set out in a clear, accessible way, and beautifully written. This work forms a much-needed critique of present practices of subjectification within special education. For that reason alone, it deserves to be taken very seriously indeed. This confronting and challenging book by Cath Laws, Poststructuralism at work with marginalised children, is the second volume in this e-book series. It is based on a long term study in which the author worked both with students categorised as 'emotionally/behaviourally disordered', and with their teachers, in the context of the special education school in which she was principal. This unique work develops radically new understandings of what it means to be positioned in the world as emotionally/behaviourally disordered. Working with these understandings this book offers strategies for working with students and with staff to enable them to become people with agency. Agency for teachers, in this context, is a capacity to read the multiple and contradictory discourses shaping both teachers and students, and shaping the social world(s) they inhabit. Agency for students, similarly, involves learning to read the discourses that play on them and through them; and it involves learning how to refuse some discourses and to mobilise others. This book enables teachers and students, together, to begin dismantling the marginal positionings that these students inhabit. Each book in this series develops an approach to research and practice that takes up the radical potential of philosophers such as Foucault, Deleuze, Butler and Nancy. Each book provides a radical model for re-thinking research and professional practices in light of poststructuralist reflections on subjectivity, relationality, ethics, spatiality and power. This series has an ongoing focus on the relations between individual subjects and the social, discursive and spatial relations within which they are produced, and produce themselves, as subjects. Poststructuralist theory made a significant break with Hegel's structuralism, with its “model of history's unbroken intelligibility” (Foucault, 2000, p. 248). In poststructuralist theory the familiar, repetitive, and habituated practices through which the creation of individual selves is done are interesting insofar as they reveal the changing practices that produce, over time, different kinds of subjects. Seeing history as discontinuous opens up the possibility that modernity’s subject, and its habitual practices, can change. Rather than being locked into present crises and patterns, such as neoliberalism with its devastating production of global economic crises, and its relentless individualising and pathologising and judgementalism, poststructuralist theory seeks the ways in which we might break loose from the already known, habitual practices through which the familiar world is produced. It opens up the ethical possibility that we might produce difference in ourselves rather than sameness, and that we might open ourselves up to new knowledges and practices. In the modern world we have placed the sovereign individual of humanism, the agent creating and in command of his/her own life, on centre stage. Poststructuralist theory decentres that individual, examining instead the repeated citations through which 'individuals' are produced. It thus cuts loose from phenomenology and existentialism with their maintenance of “the primacy of the subject and its fundamental value” (Foucault, 2000, p. 248). This is not to deny the existence of the subject, or its value, but to open up questions about its origin, its beginning point. From a poststructuralist perspective our individual agency is an effect of the ways in which we are constituted; it was not through our own agency that we were made what we are, but through our location within particular histories, relations and cultural practices. We are generally unaware of the way discourse works through us to create us in predictable, historically specific ways. Poststructuralist theory suggests that it is the very conceptualisation of the individual as primary, and as originary, that blocks this awareness. What Foucault rejects in phenomenology is the way it makes the individual subject its foundation, and sets out to “recapture the meaning of everyday experience in order to rediscover the sense in which the subject that I am is indeed responsible, in its transcendental functions, for founding that experience together with its meanings” (Foucault, 2000, p. 241). Foucault sees his own work, in marked contrast, as using experience to wrench “the subject from itself”, to find ways to make the subject “no longer itself” (2000, p. 241). He wants to annihilate the subject of phenomenology, the subject that endlessly repeats itself, that understands itself as its own origin, to dissolve it, through what he calls a “project of desubjectification” (2000, p. 241; see also Davies, 2010). Writing against the grain of the already-known is central to Foucault's radical project of opening up the not-yet-known. The already-known for Foucault, in his early years in particular, was the subject capable of permitting Nazism, or the bourgeois intellectual choosing between Truman’s America or Stalin's USSR. Whereas other post-war scholars sought to realise an ethical and responsible subject no longer capable of mindless obedience, Foucault’s project was more radical. He wanted to write his way into new understandings of how we become, in one historical period or another, subjects. His books are, he says, “experiences aimed at pulling myself free of myself, at preventing me from being the same” (2000, p. 242). It is the possibility of this kind of difference, of radical social change, that is the driving force of his work. He seeks to open up an experience of modernity that generates a transformative effect. The work that has grown out of Foucault,s program of writing, and the writing of other poststructuralist scholars, has also had a second and more recent driving force. That is the advent of the intensified individualism of neoliberal governmentality. Capitalism, according to Deleuze and Guattari (1987), is schizophrenic. It needs to control its labour force in order to extract maximum productivity from it, while at the same time enhancing the production of new and creative ideas. It convinces individuals they are free at the same time as it shapes them to be whatever capital thinks it wants. This madness of the modern capitalist state has had devastating effects on individuals and on the professions. The program of desubjectification is thus also aimed at the hyper-individualism of modern capitalism, that produces sameness and repetition under the banner of freedom. Through coming to know differently, as writer and as reader, Foucault shows how we might detach ourselves from the habitual repetitions of thought and practice through which we previously accomplished ourselves as predictable maintainers of the status quo. The individual is thus, for Foucault, not the end-point of a process of subjectification, but the potential sticking point, the place where thought gets stuck. Writing is the medium through which both thought and the writer/reader can be changed. 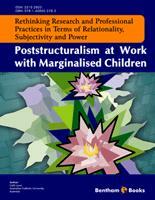 This book by Cath Laws, Poststructuralism at work with marginalised children, is just such an experience book. Laws draws on her own experiences as principal of a special school to write a transformative book, a book through which she transforms both thought and herself and, potentially, her readers. She has engaged in an experience/experiment in writing that taps into a change already underway, taking it further, participating, in doing so, in a transformation of the field that she writes about. She does not set out to produce the ‘truth’ about the work of teachers in schools for children diagnosed with emotional and behavioural disorders, as if the children were objects capable of being studied. Rather she shows how truths function within the discourses informing the work of special education teachers to produce the students, and the work that the teachers do with them. This book develops a new and significantly different approach to working with ‘emotionally/behaviourally disordered’ students. It demonstrates how those working with such children can develop and apply a poststructuralist analytic approach to their work. This approach is in marked contrast to the developmental, special education and psycho-pathologising discourses that are dominant in this field. Laws also shows in careful detail how teachers are necessarily immersed in and working out of those dominant discourses, at the same time as some of those teachers are critiquing these discourses and opening them up for change. This is a book that makes one terribly sad, as the struggles of the students at the special school are made visible in poignant and painful detail. It is uplifting at the same time, and deeply moving, when there is a break-through, when teachers find ways to recognise these marginalised students and to offer them possibilities of agency that are not self-defeating, and that do not deprive them of viable lives. It is an inspiring book, showing the way that insights gleaned from Foucault, from Butler, and from Deleuze, among others, can make visible the complex terrain teachers are working in this field, and the possible moments when different, deeply ethical practices are made possible. We are living in a time when the necessity of re_thinking ethics is an urgent task (Wyatt and Davies, 2011). This book makes a significant contribution to that task. Foucault (2000) makes an important distinction between two kinds of knowledge: savoir and connaissance. Savoir involves doing work in order to know differently and, in the process, being modified through what one comes to know. Connaissance makes possible the knowledge of objects, that is, it makes those objects intelligible, while leaving the subject, the determinate knower, untouched. Laws’ book generates savoir—a knowledge of working with marginalised students and the discourses that inform teachers’ practices, not as knowledge that leaves the writer and reader untouched, but as knowledge that, in the process of its thinking and writing, has implicated the writer in changing herself and will invite the reader to be similarly changed. Cath Laws has worked in education at regular and special schools and as a policy advisor to government in the area of special education. As principal she has led teams at a number of special schools and has worked in out-of-school contexts in state child protection policy and as the state-wide Manager, Behaviour Programs. Laws has always been interested in examining the ways children living at the margins are positioned. She looked at the discourses operating for, on and with these children and young people for her PhD thesis ‘Poststructuralism at work with marginalised children’. Laws is involved in community organisations and is currently New South Wales president of Protective Behaviours—a community-based child protection program. In 2006 Laws received the NSW Department of Education and Training (DET) Director-General’s Award for service to public education. She continues to trouble the dominant discourses constituting those at the margins through her lecturing work at the Australian Catholic University and her research and writing work. She reads her life’s work as exploring ways in which those at the margins can come to act with agency and be read and read themselves differently. Davies, B. (2010). The struggle between the individualised subject of phenomenology and the multiplicities of the poststructuralist subject: the problem of agency. Reconceptualizing Educational Research Methodology, 1(1), 54-68. Deleuze, G., & Guattari, F. (1987). A thousand plateaus: Capitalism and schizophrenia. London: Athlone Press. Foucault, M. (2000). An interview with Michel Foucault. In J. Faubion (Ed. ), Essential works of Foucault 1954–1984, Volume 3, Michel Foucault: Power (pp. 239-297). London: Penguin Books. Original interview conducted 1980. Wyatt, J., & Davies, B. (2011). Ethics. In J. Wyatt, K. Gale, S. Gannon & B. Davies, Deleuze and collaborative writing: An immanent plane of composition. New York: Peter Lang.